EVESA owes a large part of its success to the enormous capability of adaption to new development and opportunities we can offer to its customers.New technologies, enhanced knowledge and the creative minds of EVESA´s skilled personnel are the basis for a successful innovation system. EVESA´s commitment with innovation starts with the main target of our philosophy; Getting the satisfaction of our customers by meeting all their expectations. Those are the reasons why EVESA focus its innovations efforts by developing new processes and products. Extra decoloured and extra deodorized ex- rosemary, BORDANTIX ®. New odourless and colourless processes are under study in order to produce ex-rosemary with even less influence in the final products. Higher carnosic acid concentrations in ex – rosemary, BORDANTIX ®. Increasing the content in carnosic acid in EVESA´s ex-rosemary is the target of this innovation. New extraction methods and conditions are under evaluation to meet markets demands. Paprika oleoresin in powder form. Microencapsulated paprika oleoresins seems to be a new possibility in natural colouring business. EVESA is developing new trials regarding this type of products. Paprika crèmes. Paprika oleoresins mixed with flavours and other ingredients developed in order to give a final product to the end users, avoiding any extra effort in mixing. Any other oleoresins, absolutes or type of extract for different raw materials. 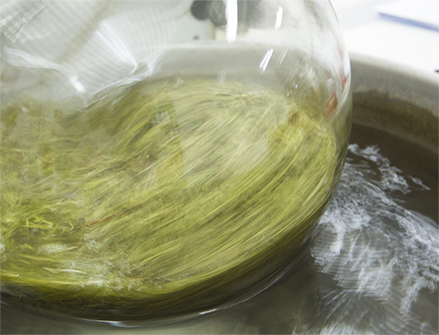 EVESA offers the possibility to develop different types of extracts from almost any potential raw materials. EVESA´s expertise production and innovation teams are ready to perform a full study of the customer´s needs to approach as much as possible to the requested new development.